Nestled in a stunning box canyon at nearly 9,000 feet above sea level, Telluride, Colorado boasts gorgeous mountain scenery, miles of all season exploration, fabulous shopping, and world-class cuisine. What was once a thriving, turn of the century mining town is now home to skiing enthusiasts, nature lovers, retired dignitaries and celebrities such as Tom Cruise, Oprah Winfrey and Jerry Seinfeld, just to name a few. It is no wonder people from all backgrounds flock to Telluride. With a schedule full of informative, fun and educational festivals, from the world renowned Telluride Film Festival to the fungus fan’s Mushroom Festival, Telluride provides a take-your-breath-away backdrop that no other place can offer. Imagine beginning your day with a cup of hot steaming coffee from one of the local meeting places in town. As residents and visitors gather to shoot the breeze over a chai mocha latte, you can almost hear the walls of Telluride’s historic old buildings whispering their own tales of life in the late 1800’s. Next, step into the 21st century, and ride the gondola up to the town’s Mountain Village, where you may take a yoga class in the warm and inviting conference center, at the posh Peaks Resort and Spa, or perhaps outside on the green grass, under the clear blue sky. After a blissful yoga class by one of the yoga festival’s talented list of presenters, visit one of the town’s many healthy restaurants. The Butcher and the Baker provides European style dining, while La Cocina de Luz brings the best flavor from south of the border, both offering local, homegrown, and organic cuisine. In between classes you may either join in on one of the free yoga sessions offered at local yoga studios such as the highly acclaimed Telluride Yoga Center, or watch an AcroYoga demonstration in a downtown park. Hula hoopers, slack liners and other amazing locals and visitors will be in full regalia, demonstrating their unique skills and talents, on and off of the yoga mat. The last yoga class of the day doesn’t mean the excitement is over. 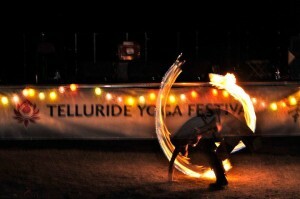 In fact, in Telluride, your evening is just about to get rolling. You may choose to have a reflective night and participate in some Kirtan chanting sessions, or visit one of the local clubs for some festive live music.